Anaerobic soil disinfestation (ASD) also known as ‘biological soil disinfestation’ or ‘reductive soil disinfestation’ is a pre-plant non-chemical soil disinfestation technique proposed as an alternative to chemical soil fumigation (CSF) for the control of several soil-borne diseases, plant-parasitic nematodes, and weeds in vegetable and fruit crops (Shennan et al. 2014; Rosskopf et al. 2015). Developed independently in Japan (Momma et al., 2013) and The Netherlands (Blok et al., 2000) for both open field and protected crops, the technique has gained interest in the USA, China and other countries (Shennan et al., 2014). The principle of the technique is to create a temporarily anaerobic soil environment to stimulate the growth of facultative and obligate anaerobic microorganisms. Under anaerobic conditions these organisms decompose the available carbon (C) source, which produces organic acids, aldehydes, alcohols, ammonia, metal ions, and volatile organic compounds that are suppressive or toxic for several soil-borne pests and diseases (Momma 2008; Huang et al. 2015; van Agtmaal et al. 2015). The ASD treatment involves three steps. (1) The first is to amend the soil with sources of readily decomposable carbon and organic matter to initiate rapid growth and respiration of soil microbes just prior to forming the raised plant beds. (2) In second step is to cover the plant bed with a polyethylene mulch that prevents oxygen from escaping from the soil surface. This maintains the anaerobic environment once it is established. (3) Step 3 is to irrigate the soil to saturate the pore space and further reduce the presence of oxygen, creating the desired anaerobic environment in the soil (Butler et al., 2014; Shennan et al., 2014). 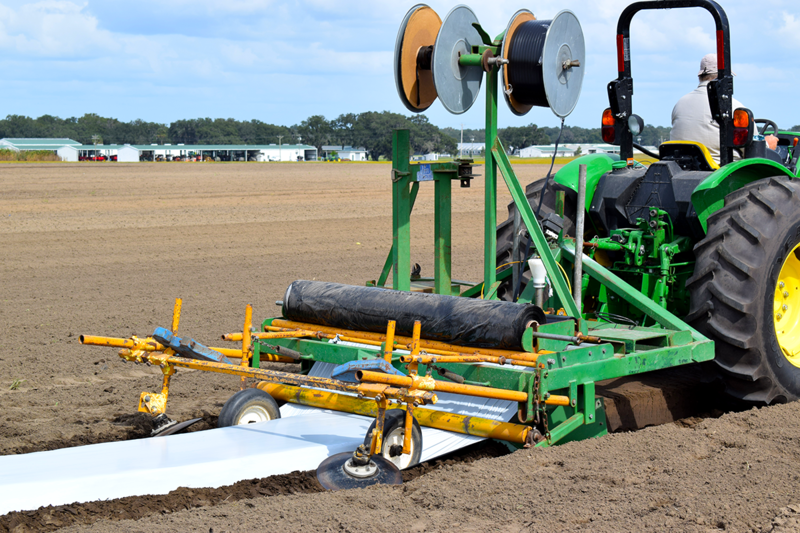 Researchers of the United States Department of Agriculture’s Agricultural Research Service (USDA-ARS) in collaboration with researchers from the University of California and the University of Florida created the process currently under study in Florida. In this research, molasses is the source of readily decomposable carbon and composted poultry litter provides the organic matter. Totally impermeable film (TIF) is used as a mulch on the bed and 2 inches of water are applied to saturate the soil. The grower can punch the plastic and transplant the planting material three weeks after treatment application. ASD has proved to be effective against several soil-borne fungal and bacterial plant diseases, plant-parasitic nematodes and weeds, across a wide range of crops and environments (Butler et al., 2012a; 2012b; Lamers et al., 2010; Momma, 2008; Rosskopf et al., 2015; Shennan et al., 2014). However, the mechanism of control is not fully understood. Researchers around the world are working to explain the changes that occur in the soil during the ASD treatment and how these changes affect the target pests and weeds. A major focus of research is to find ways to facilitate the use of this technique at a commercial scale. Guo, H., Zhao, X., Rosskopf, E.N., Di Gioia, F., Hong, J.C. & McNear Jr, D.H. (2018) Impacts of anaerobic soil disinfestation and chemical fumigation on soil microbial communities in field tomato production system. Applied Soil Ecology. 126:165-173. Johns, C., Lee, A., Springer, T., Rosskopf, E., Hong, J.C., Turechek, W., Kokalis-Burelle, N. & Finley, N. (2017) Using NMP-based metabolomics to monitor the biochemical composition of agricultural soils: A pilot study. European J. Soil Biology. 83:98-105. Serrano-Pérez, P., Rosskopf, E., De Santiago, A. & del Carmen Rodríguez-Molina, M. (2017) Anaerobic soil disinfestation reduces survival and infectivity of Phytophthora nicotianae chlamydospores in pepper. Scientia horticulturae. 215:38-48. Butler, D. Kokalis-Burelle, N., Albano, J., McCollum, T., Muramoto, J., Shennan, C., & Rosskopf, E. (2014) Anaerobic soil disinfestation (ASD) combined with soil solarization as a methyl bromide alternative: Vegetable crop performance and soil nutrient dynamics. Plant Soil. 378:365-381. Rosskopf, E.N., Burelle, N., Hong, J. C., Butler, D.M., Noling, J.W., He, Z., Booker, B. & Sances, F. (2014) Comparison of anaerobic soil disinfestation and drip-applied organic acids for raised-bed specialty crop production in Florida. Acta Hort. (ISHS). 1044:221-228. Kokalis-Burelle, N., Butler, D.M., & Rosskopf, E.N. (2013) Evaluation of cover crops with potential for use in anaerobic soil disinfestation (ASD) for susceptibility to three species of meloidogyne. Journal of Nematology. 45(4):272-278. Butler, D.M., Kokalis-Burelle, N., Muramoto, J., Shennan, C., McCollum, & Rosskopf, E.N. (2012) Impact of anaerobic soil disinfestations combined with soil solarization on plant-parasitic nematodes and introduced inoculum of soilborne plant pathogens in raised-bed vegetable production. Crop Protection. 39:33-40. Butler, D.M., Rosskopf, E.N., Kokalis-Burelle, N., Albano, J.P., Muramoto, J., & Shennan, C. (2012) Exploring warm-season cover crops as carbon sources for anaerobic soil disinfestations (ASD). Plant and Soil. 378:365-381. Paudel, B.R., Zhao, X., Di Gioia, F., Ozores-Hampton, M., Hong, J. C., and Rosskopf, E. N. (2017) Using cereal rye as a catch crop to examine the residual effects of anaerobic soil disinfestation and other biological soil management practices following open field tomato production. ASA-SSSA-CSSA International Annual Meeting. Guo, H., Zhao, X., Rosskopf, E. N., Kokalis-Burelle, N., Albano, J., Hong, J., Di Gioia, F., Ozores-Hampton, M. (2016) Effects of Anaerobic Soil Disinfestation and Herbicide Application on Tomato Production and Fruit Quality. Annual Conference of the American Society for Horticultural Sciences. HortScience 51(9) Supplement: S332-S333. Paudel, B.R., Zhao, X., Di Gioia, F., Ozores-Hampton, M., Hong, J. C., Kokalis-Burelle, N. and Rosskopf, E. N. (2017) Evaluating anaerobic soil disinfestation and other biological soil management methods for open-field tomato production in Florida. ASA-SSSA-CSSA International Annual Meeting. Di Gioia, F., Ozores-Hampton, M., Zhao, X., Thomas, J., Wilson, P., Li, Z., Hong, J., Albano, J., and Rosskopf, E. N. (2016) Anaerobic soil disinfestation impact on nutrient dynamics in fresh-market tomato. Methyl Bromide Alternatives Outreach. Rosskopf, E., Hong, J., Kokalis-Burelle, N., Ozores-Hampton, M., Di Gioia, F., Roe, N., Zhao, X., Booker, B., and Sances, F. (2016) New approaches to management of Fusarium wilt of tomato in Florida. 5th International Symposium on Tomato Disease.